Recently I was contacted by Brennan from Texas. 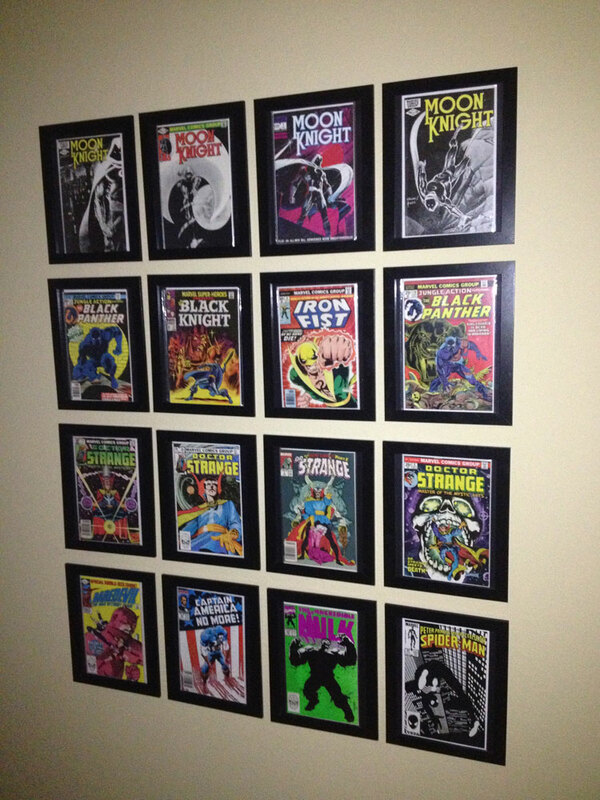 He sent me a picture of his new comic book wall using the directions from my IKEA comic book hack. Brennan had the following story to share with us about this comics and his new comic book wall. After most of my comics got destroyed in a flood about 6-7 years ago, I stopped collecting. But my parents found a box of stuff I stashed away in their garage and it turned out, most of my favorite issues and cover art were inside. Growing up, I was a bigger fan of the B-list Marvel heroes, guys like Dr. Strange, Moon Knight, Iron Fist, Black Panther and Black Knight. So naturally, I wanted a relatively inexpensive way to display them. After doing a little online research, I came across Youseph’s site and liked the results I saw. There’s an IKEA near where my folks live in Dallas and I bought 16 frames for under $40.00, picked up some black card stock at the Hobby Lobby and some Command Picture Hanging Strips, so that there wouldn’t be any damage to my walls. I chose 16 of my favorite covers from the 40 or so books I had left in my long box and my girlfriend helped me hang them up in the office. She loves them, I love them. The result was perfect. Now we’re thinking about hanging up 16 more in another part of the house! 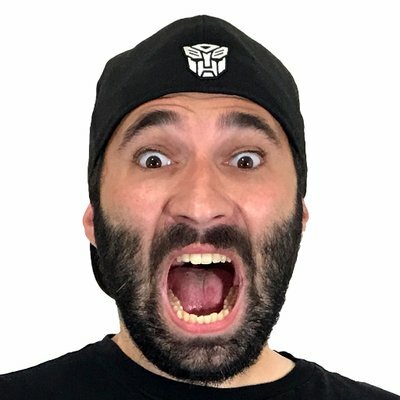 If it wasn’t for Youseph’s site, we’d have probably spent a lot more money. Thanks for the smart and effective tip! 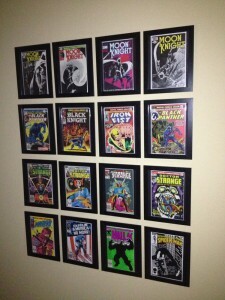 If you have a comic book wall using the IKEA hack found here, please contact me. I would love to see how it turned out for you.